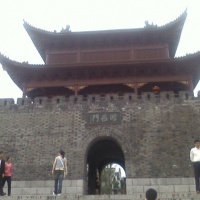 The Yueyang Tower (or Yueyang Lou, or Yueyang Pavilion) was first built in Tang Dynasty. Since ancient times, a lot of poets and writers have been here because of its striking scenery. You can get a bird's eye view of the lake when you get on the tower. Located above the gateway of the western city wall of Yueyang, the Yueyang Tower, together with the Tengwang Tower in Nanchang, Jiangxi province and the Yellow Crane Tower in Wuchang, Hubei Province, are regarded as the three most famous towers in China. Yueyang Pavilion is the major landmark of Yueyang City, comparable with Tengwang Pavilion and Huanghe Pavilion. 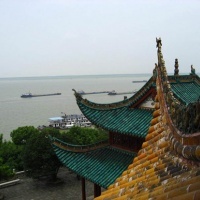 Similar with the other two, Yueyang Pavilion became famous for a famous poem too. When rebuilt in 1045, Fang Zhongyan was invited to write a poem in memory of the event. In his poem, Fang described the beauty of the structure and indicated his concern about the country and people. The poem was applauded and won the pavilion great fame. A Qing Dynasty wooden screen inscribed with the poem is housed in the pavilion. The present complex was rebuilt in 1867.